Long or Short has long covered the piratery sector. Recent retail hand bag developments have mandated we review the sector, using our patented “Bottom or Top” analysis. 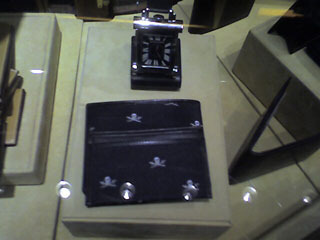 Pictured above is the Ralph Lauren Pirate Motif Billfold and Integrated Credit Card Holder ($355.00) captured in the wilds of Ralph Lauren display cases. Clearly, pirate accessories are for bottoms only. shameless self-promotion (for the last time). We acknowledge your existence, and will link to you if management of your site creates a track record worth linking to. But we generally edit out off-topic self-promotion. It does not mean we are not totally gay for you.